Green Giant vegetables have become a staple in my house since my first son was born four years ago. I know how important it is to feed my family healthy food and make sure my children are eating their vegetables. My children love all of the vegetables that have a sauce on them but I get a little worried that these may not be as healthy as a plain vegetable. That is where Green Giant Steamers come in. They are one of the first sauce free seasoned vegetable and they are delicious! 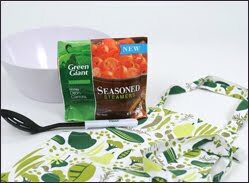 With a dash of imagination, a pinch of culinary skill, and a heap of flavor, Green Giant Seasoned Steamers™ are giving you a new reason to enjoy eating your vegetables. Shake up your vegetable routine with these flavorful, chef-inspired options that are seasoned to perfection, without a drop of sauce. Now, more than ever, you can leave your family craving more vegetables with every meal and break through meal monotony with a new palate-pleasing vegetable option for everyone! 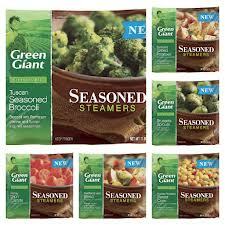 With new Green Giant Seasoned Steamers™, eating vegetables just got easier and more delicious! Green Giant Seasoned vegetables come in six flavors. The flavors are Mediterranean Blend, Tuscan Seasoned Broccoli, Brussel Sprouts with Sea Salt and Cracked Pepper, Honey Roasted Sweet Corn, Honey Dijon Carrots and Backyard Grilled Potatoes. My family and I tried the Brussel Sprouts with sea salt and cracked pepper. These were delicious! I was so surprised that they did not come out soggy but actually tasted so fresh. The salt and pepper seasoning was the perfect seasoning to give the brussel sprouts a little extra flavor. I could not believe that my two young boys actaully ate the Brussel Sprouts too. I also bought the Tuscan Seasoned Broccoli and I am looking forward to trying that one. You can find out more about these new vegetables by checking out the Green Giant web page at: Now for the giveaway... My Blog Spark and Green Giant are giving one of my readers their very own Green Giant Seasoned Steamers Prize Pack.